Ever since we've been to Vietnam, we've been bemoaning the lack of herbs in the offerings here. Where we were spoiled with side plates piled high with greenery overseas, we are lucky if we even get a single sprig of Thai basil in Auckland, let alone sawtooth coriander, rice paddy herb, or any of the other distinctive Vietnamese herbs you can find at the market. We'd even be happy with just coriander and mint, if only they were served in sufficient quantities, but no. The one exception I have come across is Cafe Hanoi (there's also a little place in Wellington, but that's so far away), where you can purchase a small herb tray for a price. 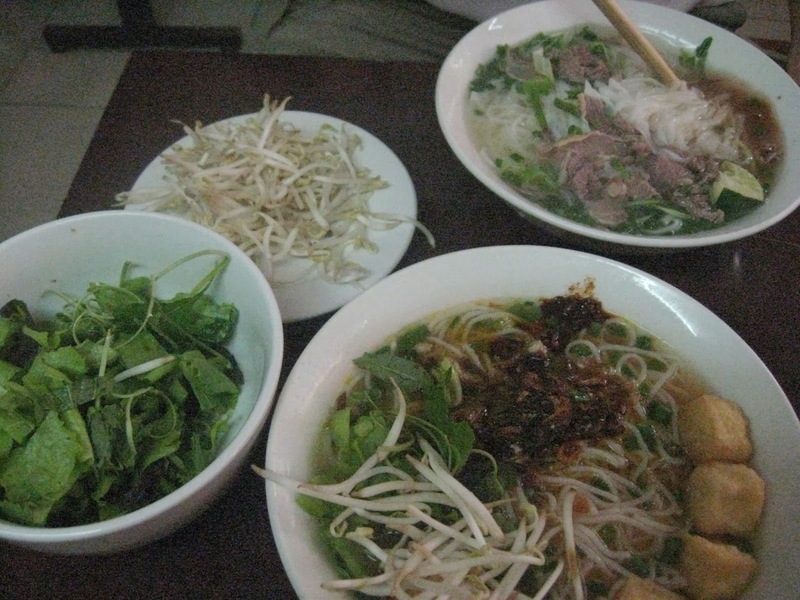 Herbs in Vietnam Exhibit 1 - with phở/noodle soup. 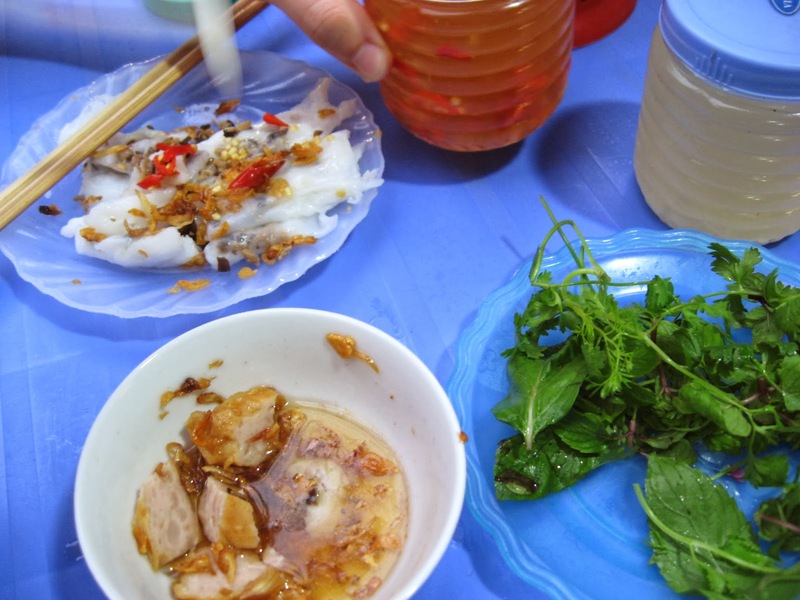 Herbs in Vietnam Exhibit 2 - with bánh xèo. Herbs in Vietnam Exhibit 3 - with freshly steamed rice rolls. 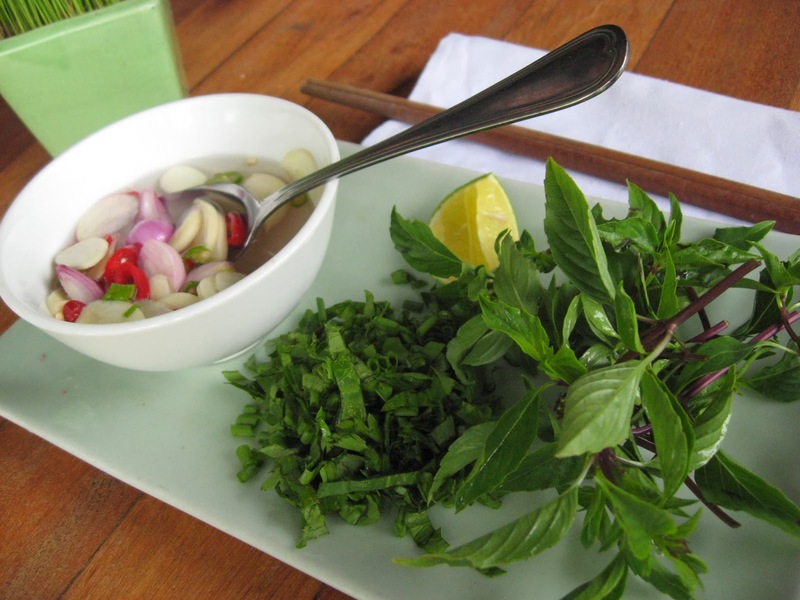 Why don't restaurants serve herbs like these with their Vietnamese meals? There was however one item we have had, which we actually enjoyed more in Auckland than we did in Vietnam*: the bánh mì Vietnamese sandwiches from a restaurant on Dominion Road which no longer exists, called Banh Mi Bale. * Actually, there was a bánh mì which we really liked in Vietnam. Unfortunately, it also made us really sick. Pictures of the old shop from Student Foodie: Auckland. Picture of Vietnamese sandwich from Chinese Town listing. I can see why the owners of Banh Mi Bale wanted to shift—the Lorne Street location they moved to in 2009 is much more central—but I don't know why they changed their menu. 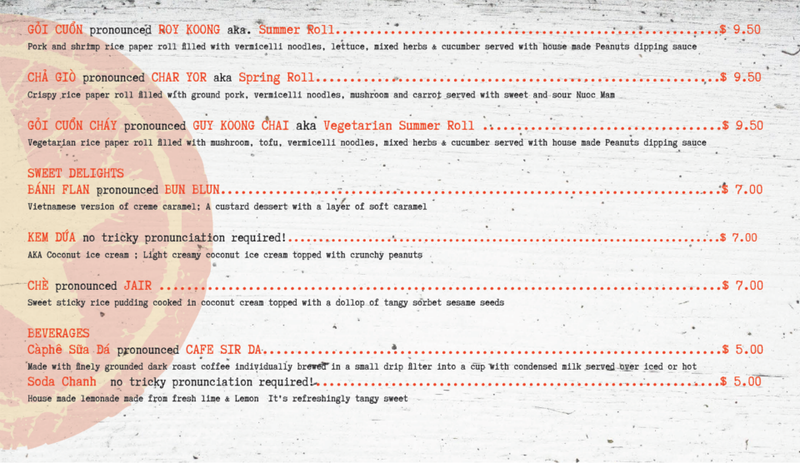 In 2011, they rebranded their restaurant to Saigon BBQ. Chinese roast meats were in; bánh mì were out. Cue sadness and despair. Later that year, they brought back the sandwiches in a new shop called Pho Saigon in the Viaduct, but that too is now gone (though when I rang up to ask about it, they said they had hopes of running it again). Selection of Vietnamese sandwiches from the original Pho Saigon in the Viaduct. When I came across a Waikato Times article about a new eatery in Hamilton called Bahn Mi Caphe, where the baguettes arrive each day from a bakery owned by the parents of the chef's Vietnamese wife, we just had to give it a go. I'm not sure we would drive out all that way very often, but we did have a good bánh mì there. Maybe not quite as good as the ones from the depths of our memories, but certainly a cut above some of the other sandwiches we have tried at various places. The baguette had a thin crust on the outside, with a soft inside, and the filling was flavourful. Banh mi from Banh Mi Caphe. We also tried a phở, which was light and refreshing, although it suffered from a lack of herbs, as with most Vietnamese eateries in this country. It was served with a wedge of lemon and slices of fresh chilli, as well as hoisin and chilli sauce, which chef and part-owner Pat explained we could either dip meat into, or scoop into the soup bowl. Pho with condiments but not much in the way of herbs. Perhaps it was because we were taking pictures of the food, but after serving prawn crackers and bún noodle salads to the next table, he brought us a massive portion of bánh flan to share, on the house. Although we were already full, this caramel custard was not very sweet, and we ended eating more than we intended. We also ordered a chè to take away. The term can refer to any number of desserts, and in this case it was a barely sweetened sticky rice pudding served with mango sorbet. Delicious custard called bánh flan. Pat told us of plans to introduce a dinner menu, once his parents-in-law arrive in a few months' time. 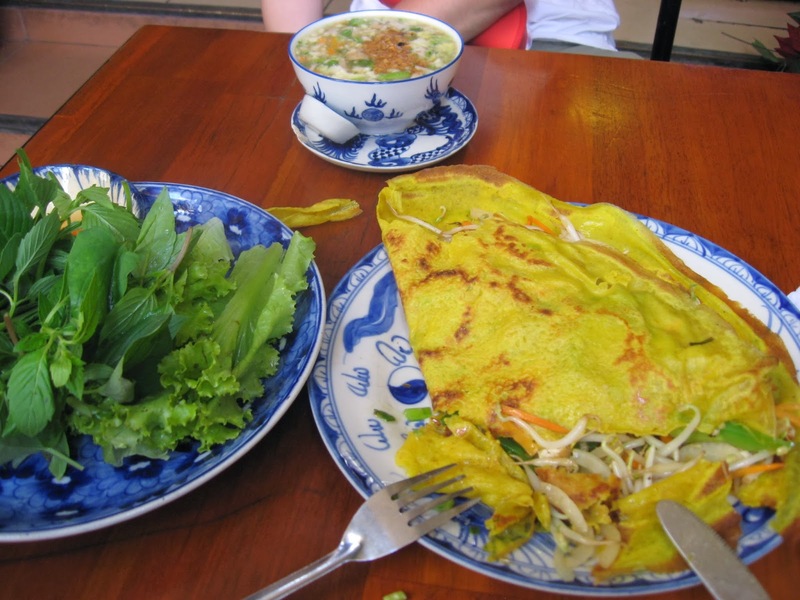 New dishes might be the Vietnamese omelette bánh xèo, as well as a cơm tấm broken rice dish. To generate a bit of a buzz, he is considering serving fried scorpion skewers too! I hope he also manages to enhance the menu by including bánh mì with slices of chả lụa (Vietnamese pork roll) and pâté, which he mentioned was a possibility. The restaurant tries to capture some street atmosphere. Banh Mi Caphe has a casual atmosphere which is based on a typical Vietnamese street scene, with phone numbers spray-painted onto the walls, stools around tables (though the stools in Vietnam were often much lower to the ground), sauce bottles on the table, a Chinese chess set. There was even a bike in the front window! The food is inexpensive and tasty, and has the potential to be even better. We would love to have the opportunity to eat here more often. If only it were closer to home! I don't normally write about places we've only been to once, but given the distance from our house to Hamilton, we can only say that what we had was good, and keep your eyes on the restaurant's Facebook page for new offerings! Yes, I agree about the herbs! Getting a slice of lemon and some bean sprouts doesn't quite cut it. And I miss that place on Dominion Rd too! Will have to try this place next time we're in Hamilton. 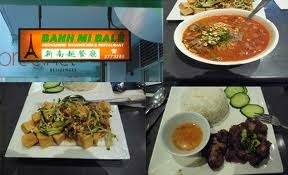 I had a banh mi in Mount Eden that was good too, if Hamilton is too far away. RAD also sells the usual cafe food for breakfast, like pancakes and eggs benedict, so it's an odd mix. 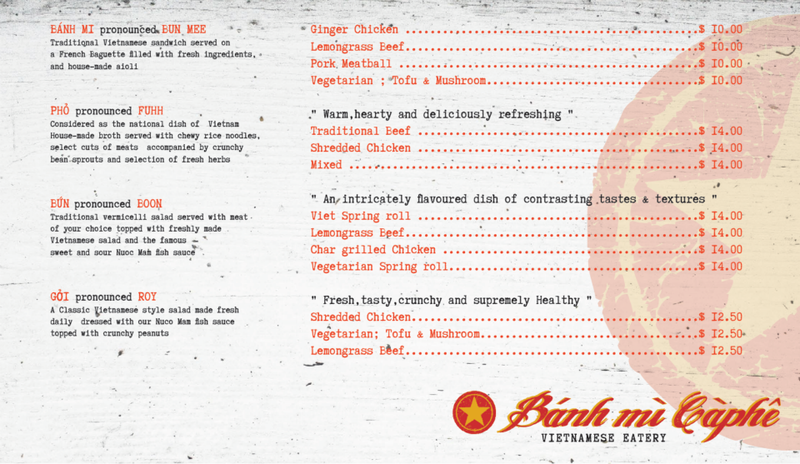 It's good to know that your trip to Hamilton wasn't in vain -the banh mi looks delicious! There's a Vietnamese place up the road from my work (who's name escapes me) that sells banh mi but I've always been to scared to venture in because it's always so dark and empty when I walk past! It's not Hanoi Village just off K'Rd, is it? Yum, we lived off Pho's when we were in Vietnam earlier this year. My partners parents live in Hamilton, we should take them here next time we are down!